Svea Ekonomi offer administrative and financial solutions for small and large companies in all industries. They now wanted a responsive website and easy access in mobile devices. My work involved research and interaction design. Svea is a privately owned group that started operating in 1981. At the time of the formation, the business idea was to primarily handle collection management for a larger company. They offer administrative and financial solutions for small and large companies in all industries. In addition to traditional services like invoice service, factoring, invoice purchases, credit information and debt collection, they are also committed to meeting the need for smart payment solutions for e-commerce, mobile and retail. They also offer lending, lending to private individuals as well as currency exchange and giroservice. Svea Ekonomi spans over 10 markets. Svea Ekonomi came to us and needed to shape up their website. They now wanted it responsive and easy to access in mobile devices. Valtech responded and gave them a team to build this in a few months. 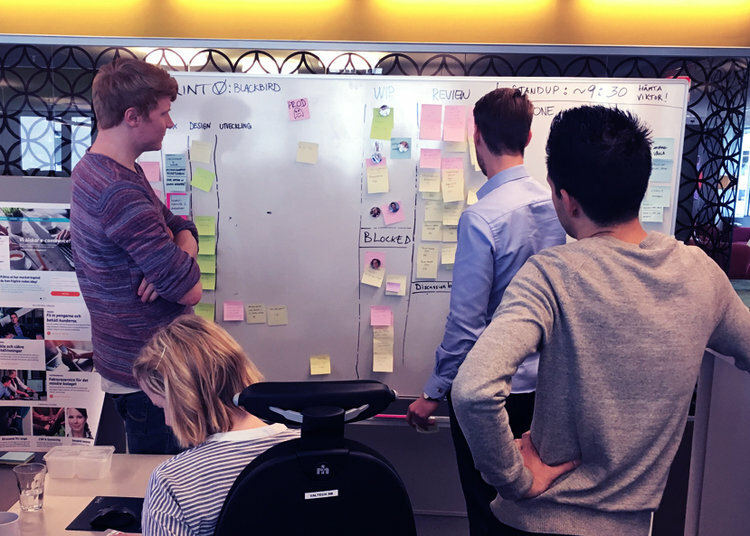 Using the scrum method, we started every day with a daily stand-up. The team consisted of a project manager, backend, frontend, design and me as UX designer. We worked closely together with the client, in their office. In each 2 week-sprint, I held interviews and workshops in order to collect information from the business and it’s clients. Art director Marcus Ögren and I also held design studios and workshops where we drew solutions on whiteboards with our reference group. I also held interviews with the support team. This is a real value to our work, they talk to users each day, and by interviewing them we could easily understand what was important (and not). Since the company spans over ten markets, I also held interviews with them, in order to understand the needs. All countries was supposed to build their own site, but with our components. We first made components for the swedish market, and then made a few other to meet their needs. At first, we made sketches on paper, had whiteboard-sessions and sat next to each other in order to make it easier for everyone to get updates on the latest needs. After one of those sessions we could easier put the details in place and get closer to a solution. That was basically when I sat down in Sketch (or did I still use Omnigraffle back then?) and made proper wireframes of the details. The site is one of Svea’s biggest windows outward. We have take care of those who come there. What do we want them to do? What is the primary goal? Is it about applying for a loan or contacting you for more information? Do not talk about multiple things on the same page, instead, concentrate on getting the user to do what you want them to do. Users doesn’t have all the knowledge. Guide them to the final destination! On all pages, we put the most important information in the top, we used clearer CTA and related information further down. If you read the whole page and reached the end without finding the information you were looking for, help is coming! We show you contact areas, but also new choices close to the subject if you took the wrong turn. This was one of the most successful projects as I see it. We had a close relationship within the team, and the client was a part of it. I probably never had so much fun in a project before. I believe the key factor was the team. I love my team. Svea Ekonomi was also nominated to Svenska Designpriset 2017 (The Swedish Design Awards) in the category “Information Digital”.